Quitting the UK; Are more young people seeking a place in the sun down-under? Working in a low-paid dead-end job in a call centre, living with the parents and approaching 30 an old friend of mine made a decision – to pack their bags and head for New Zealand on a 12 month work visa. This was a few years back and they haven’t looked back, moving after their first year to Australia. And they’re not the only one. Recently I’ve noticed more and more people have been following in this intrepid friends footsteps, in fact rarely a day goes by without hearing about some other person moving to Australia. But what do the stats have to say? My first stop is the official statistics produced by the Australian Department of Immigration and Citizenship. What I’m interested in particularly is the numbers of working holiday visas – these are the ones granted to young people aged 18-30 and which last 12 months. Though the figure has fallen slightly for 2009/10 the trend over the period shows a gradual increase suggesting that in the past few years an increasing number of young people are taking the opportunity to leave the UK for Australia using a Working Holiday visa. Rather interestingly the graph shows the peak period for the number of Working Holiday visas granted was in 2008/09 coinciding with the recession. During this period some 40 182 Working Holiday visas were granted to UK citizens. Part of the explanation may be the rising popularity of a ‘gap-year’, but as the visas are open to all people aged for 18-30 there may be another group taking increasing advantage of the Working Holiday visa programme; Twentysomethings who lack ties such as a family or mortgage (due to their unaffordability) and who find career aspirations unfulfilled, either through unemployment or the growth of the dead-end job and who therefore find both possible and attractive the prospect of leaving the UK. What the retail data reveal about changing shopping habits. I’ve always had a bit of an interest in retail, which led to my not-so-long-ago unscientific walk-round of the West Quay shopping centre, so couldn’t resist looking at the latest stats on the retail sales. 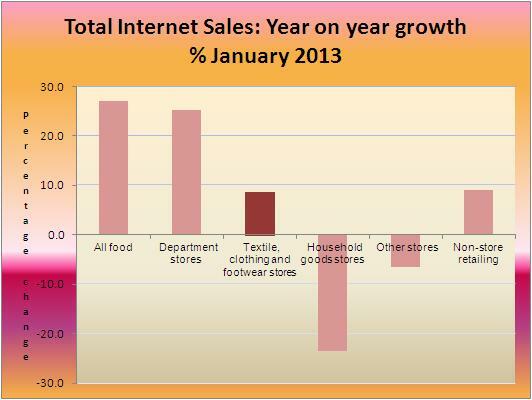 Probably the biggest trend of the last decade has to be the growth in internet shopping This graph, based on ONS data, shows the year on year growth in total retail sales for January 2013. A couple of changes here are interesting. The first is the growth internet sales among predominantly food retailers. According to the ONS in January 2013 £96.2 million, some 3.7% of sales for food stores, was online which was a record proportion for the segment. This is undoubtedly down to the rise in supermarket online shopping. I know it’s a service I’ve been using more often in the past 12 months, and will do more of in the future and now there’s click-and-collect. It all adds up to a major change in habits, although in many ways it’s a throwback to the not-so-distant past where we all used to get our milk and papers delivered to our door, a world destroyed by the supermarkets with their impressive product ranges and all-in-one-place convenience. The internet has succeeded by delivering our cake and letting us eat it. Another interesting point, not in terms of size, but perhaps significance, is the growth of internet sales in the textile, clothing and footwear stores sector. In January 2013 a not insignificant 10.6% of sales in this group were made via the internet. This is significant as this is a segment where the internet would seem to have some distinct disadvantages over in-person shopping; Whilst items like books, CDs and DVDs are all standardised products clothing is much less standardised with sizes varying between stores hence the fitting-room, which, at least for the time-being, is not something which can be replicated easily on the internet. Despite this however, online sales have grown and businesses such as ASOS (part of the non-store retailing group) have thrived. A change in our habits perhaps, are we more willing to buy without trying on, or to buy, try at home and return? If so then we’ve only seen the beginning of the transformation the internet will bring to the high-street. It seems like a strange question. Surely the Premier League, which generated 2.5 billion Euros in 2010/11 – making it by a long-shot the highest revenue generating league in the continent (according to the Deloitte 2012 Annual Review of Football Finance), which attracts the cream of the worlds footballing talent, and is breaking all records in securing £5 billion for its TV rights alone, is far more successful than the Championship, a mere second tier league. So what possible explanations exist for this? As any student of GDP growth will tell you in percentage terms it is much easier to record high levels of growth when starting from a low-base. In the analysis here The starting figures for the Championship and the Premier League are 7688 and 19563 respectively, so even a lower increase in the total figure for the Championship could see a much higher growth rate in percentage terms. 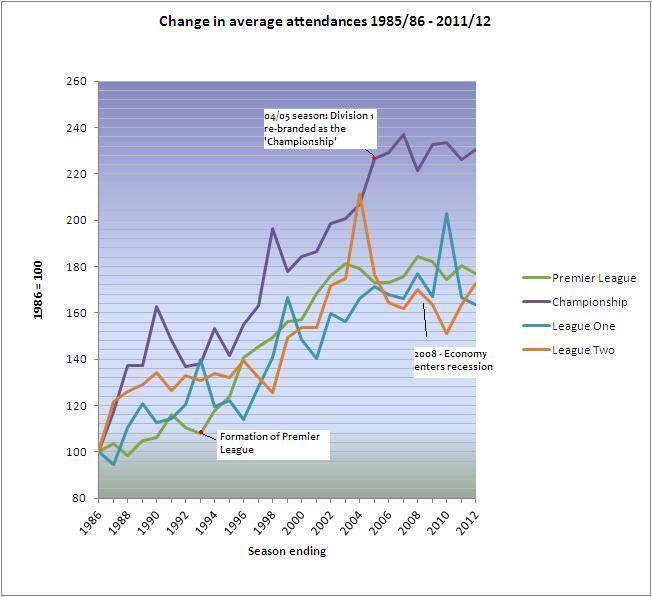 As this graph shows, for much of the period, and particularly during the 1990s, the size of the gap between the season average attendance of the two divisions actually grew. It is worth noting however, that both League 1 and League 2, also starting from a low base have displayed rated of growth more in line with the Premier league, so a mathematical quirk alone is an insufficient explanation for the Championship’s runaway success. In economic terms the Championship is like a rump steak to the Premier Leagues fillet i.e a cheaper alternative. 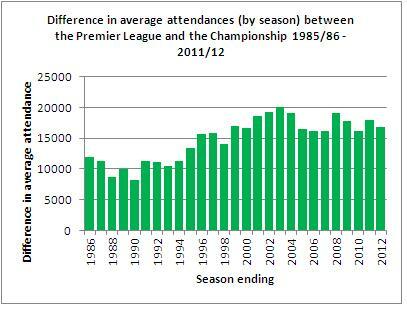 Whilst this is sure to anger many football fans who will insist that their club is the club, the question has to be asked as to whether being comparatively cheaper than the Premier League has helped the Championship to higher levels of attendance growth. It is hard to say whether this is the case, particularly as it is unclear just how much cheaper, if at all, the Championship is compared to the Premier League. As this BBC survey shows in terms of some ticket prices, particularly at the lower end of the range there are cases where Championship clubs have higher prices, for instance Man City’s cheapest season ticket is £275, whilst Hull City in the Championship offer their cheapest at £485. a particularly strong correlation in the Premier League between league finishing position and a club’s wage ranking, implying that, all other things being equal, spending more on wages translates to on-pitch success. Whereas in the Championship, the report adds, the correlation “remains relatively weak” which it suggests is indicative of the competitive nature of the league. the MLS lacks one of the joys of an unbalanced league; the David v Goliath match. And one reason why fans enjoy those encounters is that surprisingly often, given their respective budgets, David wins. As someone who counts their most memorable ever match as the time Southampton beat Manchester United 6-3 it is hard to argue with this, though to say the Championship does not have ‘big-teams’ would be to do it an injustice, perhaps it’s success is in its combination of the two; big clubs and a competitive league. Ever tried getting hold of a ticket for a Premier League game? It’s not always easy with a number of games selling-out. In the case of sell-outs demand exceeds supply which is in effect capped by stadium size. The solution – increasing stadium size – also isn’t necessarily easy. Notwithstanding the expense there is the need need for planning permission which can often lead to years of wrangling. According to the Deloitte report in 2010/11 average capacity utilisation for the Premier league was 93% whilst the figure for the total Football League stood at a much lower 58%. If supply did match demand for the Premier League it may well be that attendances and attendance growth would be much higher. Overall whilst there may be an element of mathematical quirk to the results in the opening graph, this alone does not explain the Championships strong performance. It seems quite possible that a cap on attendances imposed by stadium size has also acted to slow growth in the Premier League, but again the Championship has no more advantage here than League 1, or League 2 clubs which it has also out-performed. Price too (particularly in the current ecomomic climate) along with competitiveness may also have played a part, along with other factors we have not covered, but overall it seems the Championship has experienced a perfect-storm of factors enabling it to grow at a rate faster than the Premier League. As the Deloitte report states the Championship is the highest revenue generating second-tier league in the world, and that’s more than a mathematical quirk. Why are Londoners so anxious? 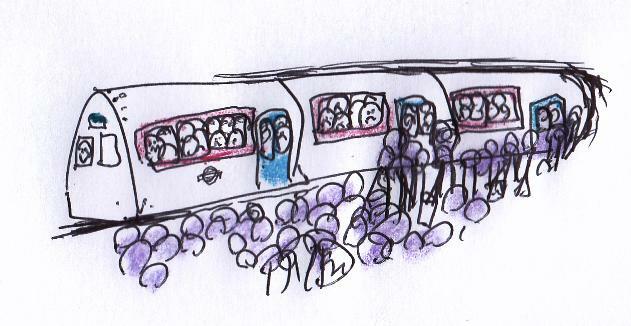 Crowded tube trains – a recipe for anxiety? I know Londoners are particularly anxious, because when asked by the Office for National statistics ‘Overall, how anxious did you feel yesterday?’ where nought is ‘not at all’ and ten is ‘completely’ 44.5% of Londoners provided a ‘high, or very high’ rating of between 4 and 10 compared to 41.8% in the next highest region, the North East, and 35.5% in the lowest, Northern Ireland. 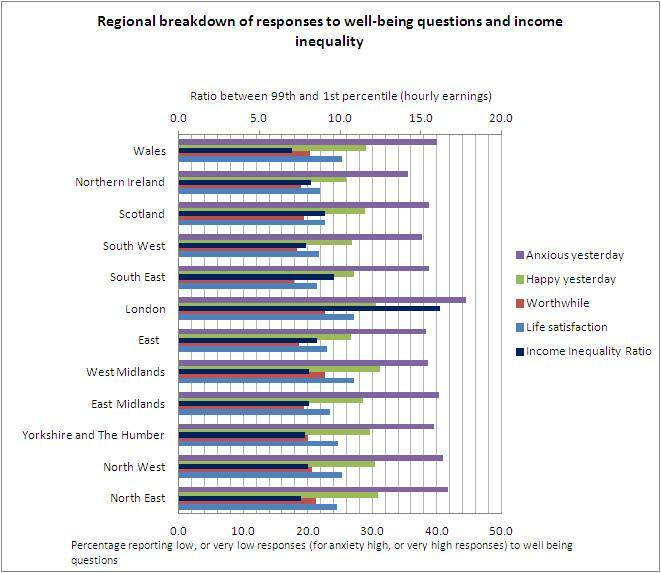 The question was asked as part of the attempt to measure national well-being and featured alongside other questions in which respondents were asked to rate their overall life satisfaction, the extent to which they felt the things they did in their life were worthwhile and their happiness the previous day – all of which Londoners tended to provide a greater amount of poor ratings compared to the rest of the UK. 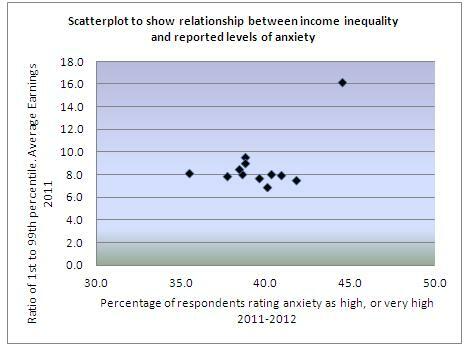 So why the anxiety? What makes London so different from the rest of the UK? It can’t be just the impact of being crammed on the tube – though that may well explain some of the anxiety. London is particularly prosperous relative to the rest of the UK, but can that really explain why people in London are more anxious? One explanation could be in the way that prosperity is divided; London is by far the most unequal place in the UK with the ratio between the hourly earnings of the 99th and 1st percentile, based on 2011 figures, being 16.2. By contrast the most equal, Wales, has a ratio less than half London’s at 7.0. Source: ONS. Well-being data Annual Population Survey, Office for National Statistics data from April 2011 – March 2012. Income data for April 2011 from Annual Survey of Hours and Earnings. In their book, The Spirit Level; Why Equality is Better for Everyone Richard Wilkinson and Kate Pickett argue that though inequality is not the cause of what have been rising levels of anxiety..
Of course even a fairly strongly correlated result would be far from conclusive owing to the small sample size, but going back to the data The South East which has the second highest inequality ratio of 9.6 had a fairly middling proportion of people recording high, or very high responses to the anxiety question, 38.8% – lower for instance that the much more equal North East (7.6 & 41.8%). What Sassen is pointing to is that high levels of inequality have helped to shape the city, both physically and culturally, creating an urban form which may well be more conducive to the sort of status anxiety mentioned by Wilkinson and Pickett which may in turn explain its inhabitants higher than average levels of anxiety. Finally the tube disgorges me at Old Street and thankful and relieved I emerge into the grey morning and gulp down the (relatively) fresh air on the surface. Maybe it is the tube after all, or else as they say on the underground, mind the gap. The end of the High-Street: Which stores are in danger?